Ubisoft's latest and upcoming games have included "bland" characters, and its inclusion of only male characters in the multiplayer of Assassin's Creed: Unity faces much criticism. Ubisoft Yves Guillemot said the company will work to improve its diversity of characters in Ubisoft games. Guillemot's comments largely concern the criticisms of Watch Dogs' protagonist Aiden Pearce, but the company has faced a lot of criticism in the past week for its comments on excluding female characters. 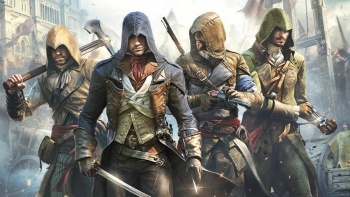 Last week when the multiplayer options for Assassin's Creed: Unity were revealed to be four extremely similar variations of a white, male assassin, critics asked why Ubisoft had decided to omit female character options from multiplayer. Ubisoft creative leads said they had excluded making female characters playable because it would take too many resources to do so. "We want to work on that," Guillemot said on diversity. "We want to spend more time on the worlds and characters in our games... you will see more and more of this at Ubisoft. We'll try to be less like we have been in the past with some characters. We'll try to extend more diversity." Ubisoft's most recent game released is Watch Dogs, which features a 39-year-old white man motivated by the death of his niece. Beyond the lack of playable female characters, many of the women in the game were killed to advance Aiden's storyline, a trope called "fridging." "We knew it would be polarizing," Guillemot said in regard to Watch Dogs. "Some people loved the characters and some didn't. It was difficult to please everybody with that character. Now, having seen the reaction, we know what we will do next to improve that."